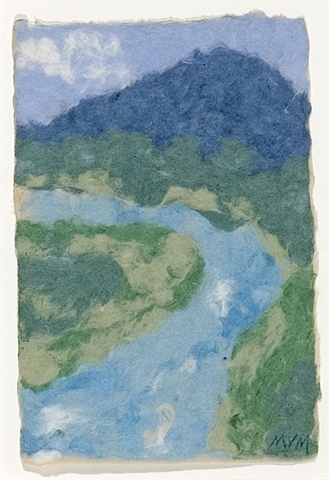 Visions of streams tumbling down the mountains near my New Hampshire home inspired this paper painting. The "paint" for this artwork consists of a slurry of pigmented plant fibers and water: the papermaker's pulp. The shape of the wooden mould used to form a base sheet determined the shape of the painting. To form the design, I applied colored pulps to a wet base sheet. The finished wet paper painting was transferred to a wooden board and air-dried. The paper painting is contained in a white cotton rag mat and wooden frame. The matting and framing materials are archival quality.